I would like the record to show that I went into “Bohemian Rhapsody” with high expectations and lots of excitement, and I did not leave disappointed. I let the craze of the film’s release muster over the weekend before seeing it Monday evening. I was not surprised to see every seat in the theater occupied and majority of the crowd being older than 35 years of age. Rami Malek stars as musician Freddiewww Mercury in this highly anticipated biopic documenting the artist, and his rock band Queen’s historic rise in the ’80s. It was funny, a gentleman beside me asked me, “Aren’t you too young to know who these guys are?” I had to suppress a laugh and tell him I wasn’t, and that I grew up on Queen because of my father; the gentleman appreciated that my father liked Queen and played it around me. He said, “Your father was smart to teach you right.” What can I say? Queen is for all misfits of any age. “Bohemian Rhapsody” is a biopic of Freddie Mercury and the rock group Queen. The film pays tribute to Mercury’s life through his struggle of coming to terms with his sexuality and his diagnosis with AIDS as well as the success of some of the band’s famous records. Despite not getting an in-depth look at Mercury’s life, the audience still got an understanding of how hard it was for him to come to terms with his sexuality and how the drugs and alcohol affected his relationships and his career with the band. Fans were treated to some of Queen’s historic musical performances, like their Live Aid show back in 1985, and the creation of popular songs like “Bohemian Rhapsody” and “We Will Rock You,” among others. 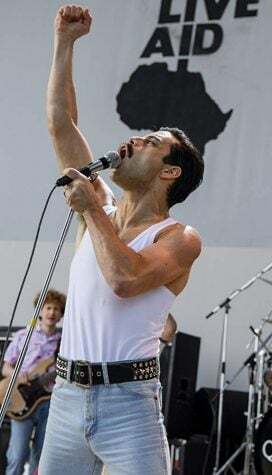 The film has a fantastic balance of conflict and entertainment between Mercury coming to the realization that his partner had played him and destroyed his relationships with his friends, to the final 25 minutes of the film which consist of Queen’s performance at Live Aid. There were times of silence and there were times of synchronized singing from the audience – it is truly a film for the fans. During its opening weekend, “Bohemian Rhapsody” earned over $51 million in the box office, making it the No. 1 film in the country. Despite its success in the box office, critics did not like this movie at all, giving the film a very poor rating; Rotten Tomatoes gave it a meager 61% rating. 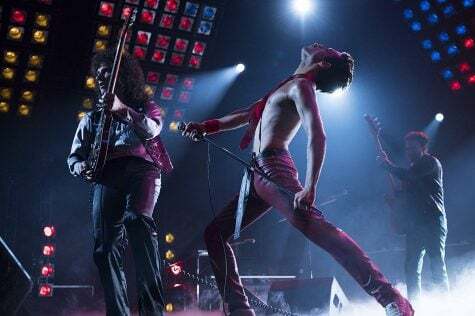 “Bohemian Rhapsody is less about Freddie Mercury (who died in 1991), and much more about Queen,” movie critic Katie Walsh wrote in the Chicago Tribune. Walsh went on to praise Rami Malek for his performance as Freddie Mercury and that the casting of Mercury’s bandmates was perfect. Walsh gave the film two and half stars out of five. Like Walsh, many other critics thought the film didn’t do justice to the legacy of Mercury and focused more on the band as a whole. Hornaday gave “Bohemian Rhapsody” a rating of two and a half stars out of four. I can see where people were upset with this film and the way it turned out, but I also understand why it is the way it is. Director Bryan Singer had a vision for this film with the time length he was given to do so, and I feel as though he did a great job with it. Being a fan of Queen myself, I know that there was too much that could have been said about Mercury’s legacy as well as Queen’s itself. The film would be much longer than two and a half hours if Singer was to dive deep into Mercury’s story. The film has been criticized for it’s handling of Mercury’s sexuality and AIDS diagnosis. I also understand that there was a lot of research and help from former bandmates Brian May and Roger Taylor when the writing of this film began. So I have to believe that if May and Taylor didn’t like something that was being written, they had the opportunity to speak out about it and have it changed in the script. Fans reaction and excitement for this film is what made it so successful. Fans on Rotten Tomatoes gave the film a 94% satisfaction rating. On Google users can leave a review of the film and, after going through the reviews for 10 minutes, I found an overwhelming amount of positive feedback. There were fans that were disappointed of course, but the overall impression I got was that of happiness in regard to the film. To summarize my favorite review I stumbled upon on Google, one woman said she was a huge fan and has read every biography she could get her hands on, but she knew this film would in no way be able to get a full and accurate account of everything that happened in Mercury’s life, as well as the bands success. She said she went into the film with an open mind but was hoping the writers wouldn’t turn it into a bashing session, and she was happy to leave the film knowing they didn’t. She went on to say how she thought May and Taylor did a great job at helping bring this story to life, while protecting Mercury and other people who were key figures in the story. I read her review and felt she hit the nail on the head – there was no chance that this film would give the audience a full and accurate look into the legacy of Freddie Mercury and Queen. This is exactly how I felt going into the film and how I felt leaving the theater. If you haven’t seen “Bohemian Rhapsody” I recommend you do before the film is released on DVD. It is something you need to seen on the big screen because of the many musical performances that occur throughout the film. I enjoyed the film and think you have to experience it at least once because this is a film about one of the biggest entertainers the world has ever seen and someone who changed the scope of the music industry for years to come.